Chronic Obstructive Pulmonary Disease, or COPD, is the third leading cause of death in the United States, behind heart disease and cancer. The most common forms of the disease are emphysema and chronic bronchitis. About 12 million Americans have been diagnosed with COPD, and experts estimate another 12 million remain undiagnosed. The U.S. Environmental Protection Agency says exposure to air pollution particles may aggravate COPD and be responsible for COPD-related hospitalization and premature deaths. Recent research suggests air pollution may play a role in the onset of COPD as well. The U.S. Centers for Disease Control and Prevention now recommends reducing exposure to air pollutants at home and work to prevent early development of COPD. The right air cleaning system can effectively remove a large percentage of the particles associated with COPD problems indoors. But the wrong air cleaner can be ineffective or, even worse, dangerous. Choose “mechanical filtration” air cleaning technology. This is the air purification technology recommended by the American Lung Association, and includes HEPA-filtration systems. HEPA stands for High Efficiency Particulate Air. Mechanical filtration systems remove particles from the air by capturing them on filter materials. The particles then remain in the filter until it is replaced. In order to make a HEPA filter, glass fibers are used, arranged in a unique configuration so that air is able to pass through the filter while large contaminants such as allergens, mold or dust are captured. The pollutant particles are captured using several different principles. For the most part particles come into contact with the filter, and are then trapped based on the principle of adhesion while clean air is free to circulate. Other cases include contaminants being trapped after achieving partial contact with the glass fibers, or being pressed up against the filter because of the strong air flow inside the purifier.Furthermore, airborne particles are attracted by other particles which are already trapped by the HEPA filter. Thanks to these various ways of stopping contaminant particles before they are able to pass through, HEPA filters can collect 99.9% of airborne impurities as long as they’re larger than 0.3 microns in diameter. Since most contaminants fall into that category, just imagine how much of an impact these filters have on the quality of air you breathe. Dust, allergens, pollen, dust mites, pet dander, mildew and mildew spores are all eliminated with the use of a HEPA filter (especially useful for people who suffer with COPD, asthma or hay fever). Don’t buy air cleaners that produce ozone. Ozone is a lung irritant that can damage the lungs, and is especially dangerous for those with COPD or other respiratory conditions. That’s why the American Lung Association and others warn consumers to avoid these devices. Avoid air purifiers that use ionization to clean the air. Ionizers generate ions that attach to airborne pollution particles, giving them a charge so that they then attach to nearby surfaces such as walls or furniture. Even air purifiers that combine ionizers with filters or air-cleaning “plates” can release thousands of charged particles into a room. The EPA says air cleaners that generate ions can increase the particles being deposited into your lungs and absorbed into your bloodstream. Choose an air purifier that is proven to protect against ultrafine particles. Ultrafine particles represent 90 percent of all the particles in the air you breathe, and are considered by scientists to be the most dangerous of all. Yet they are so small many air purifiers can’t stop them. Ultrafine particles pass rapidly into the human circulatory system and reach internal organs. Individuals with COPD may be at greater risk than healthy individuals when exposed to ultrafine particles. See my list below of the the very best air purifiers for COPD, which will clear your inside air or ultrafine particles. Do not rely only on CADR (Clean Air Delivery Rate) ratings. Small Particle Filtration Effectiveness Not Shown – CADR numbers do not adequately inform customers of a purifier’s ability to filter out very small particles. Yet these are the most numerous, and often the most dangerous, pollutants. Looking at an air cleaner’s Clean Air Delivery Rate, you cannot tell how effective it is in dealing specifically with these tiniest bits of matter. Many air purifiers eliminate larger particles very well but are almost completely incapable of removing smaller ones from circulation. Gas Filtration Not Measured – The test does absolutely nothing to measure a purifier’s ability to rid the air of gaseous pollutants, such as dangerous Volatile Organic Compounds. The three CADR numbers all refer to particulate pollution only, which is very different from gaseous pollution. Air purifiers vary wildly in their ability to deal with the latter. Because cleaning gas pollution requires different mechanisms from cleaning solid particle pollution, a purifier’s effectiveness at reducing gas is completely unrelated to its effectiveness at reducing particles. Doesn’t Show Decline in Effectiveness Over Time – Because the test is so short, it does not account for the fact that some purifiers will decline in effectiveness over time. Purifiers Run At Their Highest Settings – Fourth, in the ANSI/AHAM AC-1 test, purifiers are always run on their highest setting. But users will often use lower settings to reduce noise, and this can drastically reduce the efficiency of an air cleaner. CADR is one tool to measure the effectiveness of air purifiers. It should neither be ignored, nor considered the only important factor in determining the value of an air cleaner. Instead, potential customers should check for CADR numbers as one of a number of things to keep in mind, along with other factors such as long-term durability and the ability to filter out gasses and odors. If you want an air cleaner that excels at both particle removal and odor suppression, the Blueair 503 is a top choice. It’s got the capacity to handle large rooms and clear them of allergens and other particles quickly. You’ll want to spring for the optional SmokeStop filters if odor suppression is at the top of your list; they are judged to be highly effective. 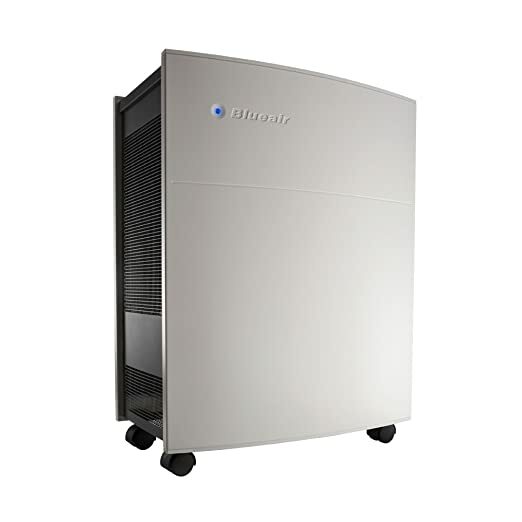 The Blueair 503 is also a quiet worker at all but the top speed. Despite the presence of an ion generator, no ozone is produced — another plus. The Blueair 503 is a solid performer capable of cleaning moderately large rooms, such as a living room. Though not inexpensive — especially if you opt for the SmokeStop filters for better odor suppression — both the purchase price and ongoing operating costs are lower than some other well-regarded air cleaners. The Blueair is both fast and effective, tests say. The five year warranty is another plus — but you’ll need to register (free) to get that and remember to change the filters as recommended. Noticeable improvement in air quality. The Blueair 503 is capable of filtering air from medium to large rooms, up to 580 square feet according to its AHAM rating, though some experts say that 400 square feet — or the size of a typical living room is more realistic. Testing at TheSweetHome.com revealed that the 503 was the fastest of any air purifier tested, making it an especially good choice for busy spots. According to testers at one professional consumer organization, the Blueair 503 does an excellent job at removing dust, pollen and cigarette smoke at its highest setting, and a good job at the low setting. The best results in removing odors requires use of the optional SmokeStop filters (Est. 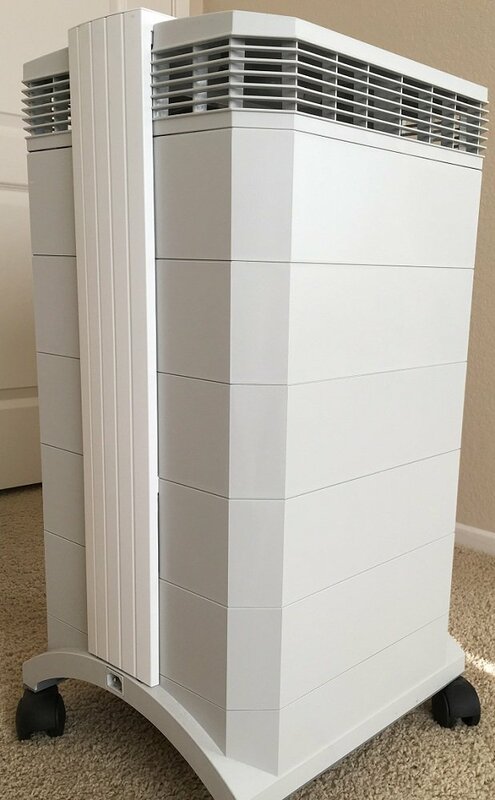 $150 per set), but with those in place, the 503 is competitive with the best air purifiers in that regard. More than 70 percent of owners posting reviews to Amazon.com give this unit a perfect 5-star rating, and it earns an overall grade of 4.5-stars after 80 reviews. Several owners point out that they notice a difference in allergy symptoms within hours of turning the unit on. The Blueair 503’s filter is capable of removing 99.7 percent of particles down to 0.1 microns in size. Easy to use, simple filter changes. TEditors of AllergyBuyersClub.com give the Blueair 503 a perfect 5-star rating for ease of operation and filter changing. The filters do require replacing every six months, although a filter-change indicator lets owners know when it’s time for a replacement and the task is said to be easy. This air purifier weighs about 35 pounds, but caster wheels make the Blueair 503 easier to move from room to room. Low noise in most regards. In one professional test, the Blueair 503 gets only a fair rating for noise level at the highest speed setting, but an excellent score for noise at the low setting. However, Ed Sherbenou at Air-Purifier-Power.com says that at speeds where the 503 will most often be used by most owners, the noise level is actually relatively good compared to similar devices. Most owners posting reviews to Amazon.com say the Blueair 503 is so quiet that it can be used in bedrooms at the lower speed settings without disturbing sleep. There are a few detractors who complain that it’s too loud, however. Filter changes every six months add up. The Blueair 503 is one of the more expensive room air purifiers available, although it costs less than some other premium models, such as the IQAir New Edition HealthPro Plus. Its filters (Est. $80 per set) must be changed every six months, which contributes to the overall cost of ownership — and that goes up even more if you opt for the SmokeStop filters instead. The Blueair 503 is backed by a five-year warranty in case of defects or malfunctions, but you must register the air cleaner to qualify (free), and be able to prove that you’ve kept up with the filter replacement schedule, so hang on to your receipts. The IQAir New Edition HealthPro Plus earns some mixed reviews, but it’s highly prized by experts and owners who are the most troubled by chemical sensitivities and odors. Pluses include superior filtration that removes particles down to 0.003 microns in size – better than a HEPA filter. It can handle rooms up to 900 square feet. The IQAir New Edition HealthPro Plus gets rave reviews from many experts and owners for its superior allergen-removal capabilities, though a lukewarm reception from some for its particle removal effectiveness and its cost. The latest version of this air cleaner is rated to remove particles even smaller in size than standard HEPA filters can handle, though that performance is not always borne out in testing. The Plus portion of this unit is the addition of a V5 filter for odor and chemical removal, and the HealthPro Plus is a top choice in that regard. Though this New Edition is quieter than previous models, some reviewers say it still gets pretty loud on the highest setting. Great for odors, so-so on particles. Multiple reviews, both professional and owner-written, say the IQAir New Edition HealthPro Plus is a terrific choice for those suffering from chemical sensitivities. It’s been revamped with a HyperHEPA filter to capture particles tinier than a normal HEPA filter can — down to 0.003 microns in size, but well-documented testing by The SweetHome.com reveals only okay results when it comes to removing particles from the air. IQAir is the educational partner for the American Lung Association and was used by the Hong Kong Hospital Authority during the 2003 SARS outbreak. Advanced controls with presetting features. The IQAir New Edition HealthPro Plus comes in sturdy packaging and is easy to set up. The package includes optional casters for moving the unit from place to place easily if needed. The IQAir New Edition HealthPro Plus offers advanced controls that are intuitive to use, navigating the unit’s six speed settings and other features. New Edition is quieter, thanks to upgrades. A few owners and experts say this air purifier can be loud when run on its highest setting. Upgrades over the previous IQAir HealthPro Plus reportedly made the current version 32 percent quieter. Multiple filters to replace. 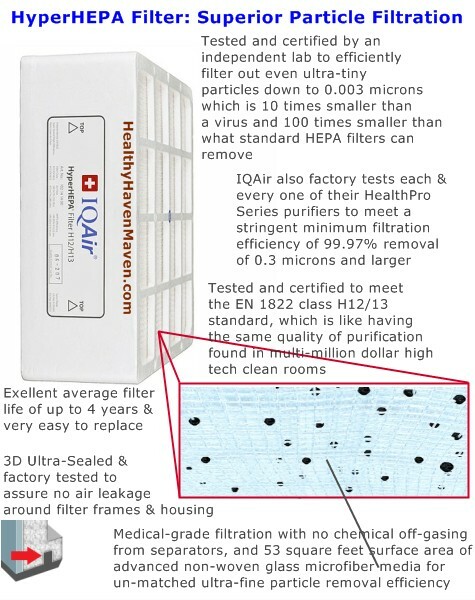 The IQAir New Edition HealthPro Plus is expensive, and it has several filters that need to be replaced periodically: the prefilter (Est. $80) every six to 18 months, gas and odor filter (Est. $90) every one to two years and the HyperHEPA filter (Est. $200) every two to four years. 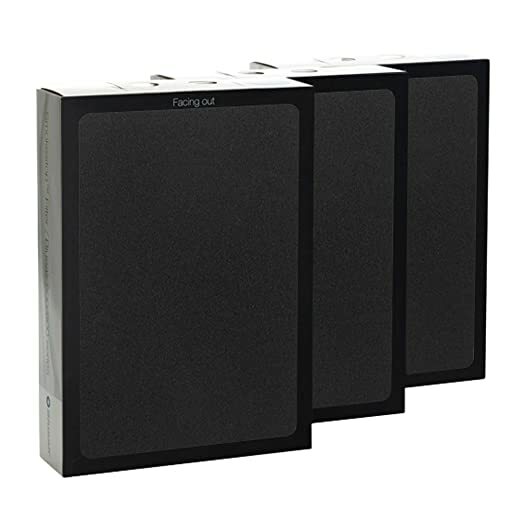 A few reviews point out that, because the filters are all on different replacement schedules, it does offset the cost of having to replace multiple filters simultaneously. In one test, energy consumption was a serious concern as it used considerably more power than competing models. The Whirlpool AP51030K Whispure air purifier is one of the quietest air purifiers available — it’s even tolerable for nighttime use at its lower speed setting. Despite its low price, The Whispure is very effective at removing dust and allergens from the air. It uses both HEPA and carbon filters for removing light odors and chemicals. The Whirlpool AP51030K Whispure air purifier is a solid performer that costs less up front than some premium air cleaners, although it’s less effective than some in clearing odors or chemicals from the air. 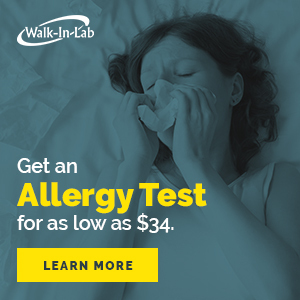 But when it comes to particle removal, the Whispure is top-rated in professional reviews and gets excellent ratings from owners, who say there’s a noticeable difference in air quality and a reduction in allergy symptoms. Another plus is that the electronic controls make it a cinch to use. Noticeable improvement in air quality. The Whirlpool AP51030K Whispure air purifier gets top marks in one major test, where it exceeds expectations for filtering dust, pollen and cigarette smoke out of the air on high and low fan speeds. Editors at AllergyBuyersClub.com say the Whispure “significantly reduced the particle count in the room” and note its “impressive” ability to clean large rooms considering the size of the unit. Hundreds of owners contributing to sites like Amazon.com concur, noting that the Whirlpool AP51030K Whispure noticeably reduces dust particles in rooms and eliminates allergy and asthma symptoms. Intuitive electronic controls. The Whirlpool Whispure is easy to use, with electronic controls and a “nicely-labeled” dashboard, according to editors at AllergyBuyersClub.com. Editors also point out the convenience of the five-stage filter status indicator, noting that it lets you know when the filter is reaching the end of its life in ample time to order or purchase a replacement. Owners posting feedback at user review sites say the controls are simple to use and appreciate the various options for fan speed, which aids in noise control. Expensive replacement filters. The initial cost of this air purifier is less than that of premium air cleaners. However, replacement filters are expensive and can wind up costing as much as half of the original purchase price per year, Sherbenou says. The Whispure’s five-year warranty is good, and should offer some peace of mind for owners. The Honeywell 50250-S is an effective option that’s rated for small spaces up to about 390 feet. It offers excellent performance at removing dust, pollen and smoke at its high speed and still performs well at its lower speeds. 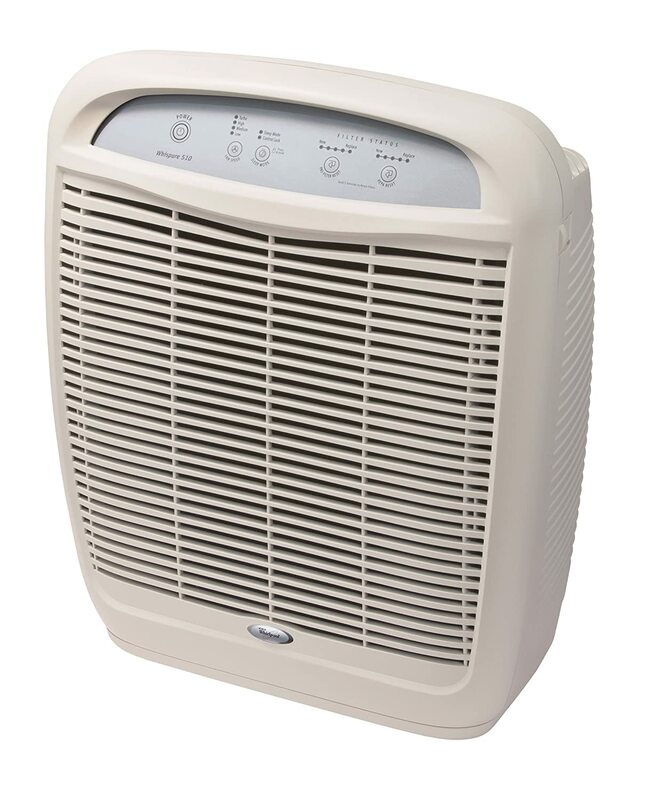 This Honeywell is one of the least expensive air purifiers available, and its HEPA filter is long lasting and inexpensive to replace. 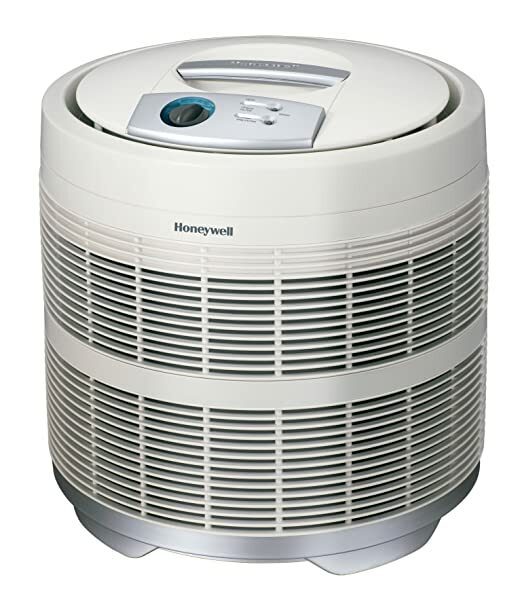 The Honeywell 50250-S is best used in small spaces, and does a good job of removing dust and other allergens from the air. The biggest complaint surrounding this unit is that it’s noisy, noticeable even at low speeds. A near identical version, the Honeywell 50250-N, is said to have permanent filters, but that’s more marketing than reality as its filters, too, need to be replaced. That matters little as the filters in both models last a long time and are relatively cheap. Good for small rooms. The Honeywell 50250-S is best used in small rooms as it’s not powerful enough to clean rooms with larger capacity. The Honeywell air purifier takes in air from all sides of its cylindrical design, expelling clean air out the top, but it doesn’t pull as much air through its HEPA filter as more expensive models, such as the Blueair 503, experts say. Still, notes Ed Sherbenou of Air-Purifier-Power.com, this air cleaner offers “a lot of power for the money.” Testers from one professional consumer testing organization say the Honeywell 50250 is excellent at removing dust, pollen and cigarette smoke at its high setting, and also does a good job at the low setting. Easy use with filter indicator lights. Filter indicator lights let users know when it’s time to change out — or at least vacuum — the filter for maximum performance. The unit itself is fairly large, according to Sherbenou, and it needs to sit a minimum of three feet away from a wall. Therefore, it will take up some available space in the room. It’s lightweight (just 20 pounds) and has a carrying handle at the top for easy transfer from room to room. Replacement filters are easy to find online or in stores. Noticeable noise on low, quite loud on high. Sherbenou praises the Honeywell’s cleaning power, but says he rarely will use it in his bedroom because of the noise. One professional testing organization gives the Honeywell 50250 a rating of Poor for its noise level at the highest fan speed setting, and a slightly better rating of Good for noise at the lower speed settings. Affordable filters, low up-front cost. The Honeywell’s long-lasting HEPA filter should be vacuumed twice a year, but Sherbenou says it will eventually have to be replaced. The Honeywell also uses an odor-reducing carbon prefilter (Est. $15) that should be replaced every three months. It’s not Energy Star qualified, but power draw isn’t terrible — about as much as two standard light bulbs, Sherbenou says. Furnace filters such as the Filtrete Ultimate Allergen 1900 cost significantly less than air purifiers, and experts say they can be just as effective for many users. The Ultimate Allergen 1900 is part of a series of Filtrete filters that are designed to remove coarse to fine particles from the air distributed by a hot air heating system and/or central air conditioning. Owners say they notice a difference in allergy symptoms, and these filters add zero noise to the home. Slipping a filter into your home’s forced-air heating/cooling system is one of the most effective and least expensive ways to clean the air, experts say — sometimes eliminating the need for a stand-alone air purifier. The Filtrete Ultimate Allergen 1900 gets excellent reviews from both professional review sources and users, with many noting a significant reduction in allergy symptoms. Excellent at removing allergens and smoke. Filtrete filters, including the Ultimate Allergen 1900, do an excellent job of trapping dust and pollen in one expert comparison test and a good job at cigarette smoke removal, too. The 1900 in the model number is its microparticle rating, with higher numbers indicating a finer microparticle removal capability. Filtrete filters are available with ratings as low as 600 MPR all the way to 2,400 MPR (microparticle rating). All rate well in user reviews, and several, including the Ultimate Allergen 1900, score well with the pros as well. Anecdotally, users report that they dust less, sneeze less and need less allergy medicine after they installed a Filtrete filter in their home heating/cooling systems. No stand-alone air purifier unit required. Filtrete filters (made of pleated electrostatically charged fiber) are inexpensive, disposable and easy to find at discount and home improvement stores. They work in an existing furnace to replace standard furnace filters for a higher level of filtration. All of the Filtrete filters allow very good airflow to the furnace, according to one expert test, but you should change the filter every three months to keep it from clogging up. The most common issue cited by owners posting feedback to Amazon.com, however, is that these filters may cause some furnaces to overheat. Costly among furnace filters, but worth it. 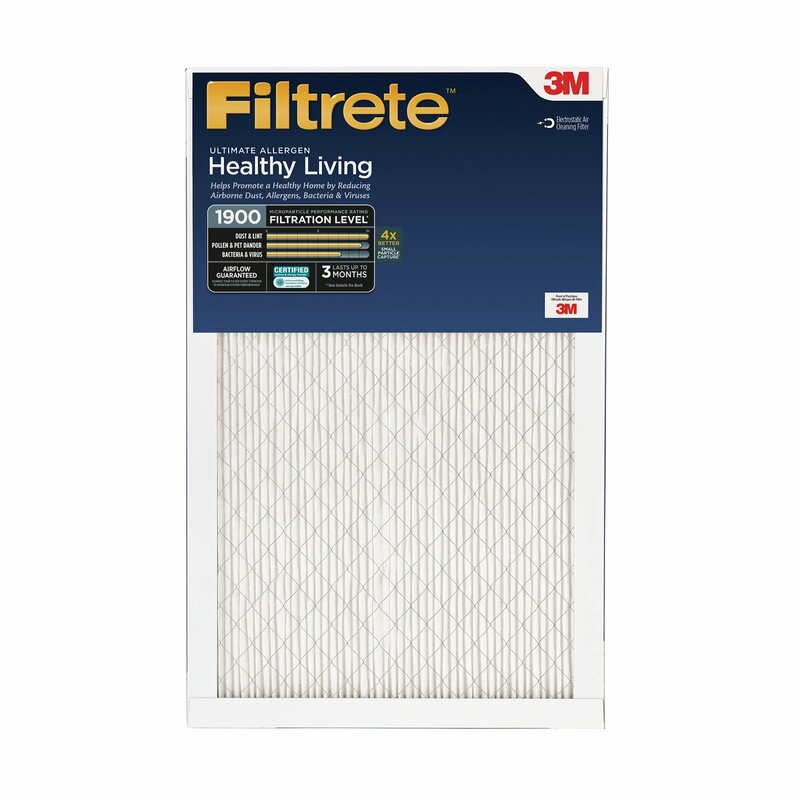 Filtrete filters vary in cost depending on their size and MPR rating, and some cheaper still options are available, but the majority of owners posting feedback to Amazon.com are more than happy to pay the additional cost for the allergy relief these provide. One professional review notes that while the filter price is relatively high, overall operating costs are relatively low. The manufacturer rates the filters as having a three-month life span. Compared to a stand-alone air purifier, which can cost several hundred to well over one thousand dollars and still require periodic filter replacements, Filtrete filters seem reasonably priced, many say. Remember that doctors often advise you to limit your exposure to pollutants in the air that can aggravate COPD. From dust and pollen to paint fumes and chemical vapors, a wide variety of particulate can inflame airways and worsen breathing conditions. HEPA air purifiers help to reduce these things by filtering out these pollutants, both particulate and chemical vapors. Keeping your house clean and reducing dust are also basic but helpful measures that can help anyone coping with COPD. Using a HEPA filter in your home can remove most airborne particles that might make COPD worse. But the particles suspended in air are not the only ones in your home. There are far more in your rugs, bedding, and drapes, and resting on countertops and tabletops, so it’s important to keep these areas clean. It’s also important, when possible, to get rid of the source of irritants. For example, the only effective way to keep tobacco smoke out of your home is to not smoke. Air purifiers can be an important part of a plan to remove irritating particles from your home. I hope this article provided you some helpful ideas. I welcome your comments below.